Sunrise provides a positive and accepting environment for individuals who require social and learning opportunities after graduating from High School. 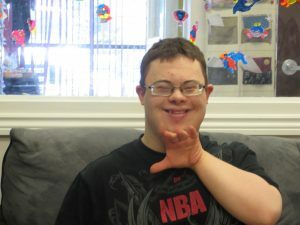 With a participant-to-staff ratio of 4:1 or better, SYG’s Day Program creates a safe and supportive environment where all individuals feel welcome. It assists in the development and retention of work experience, life skills and social interaction in a group environment. This Program involves all participants and staff planning, prepping and preparing a nutritious lunch to enjoy. The Hot Lunch program increases meal preparation skills, kitchen and food safety knowledge, budgeting skills and community involvement. The participants contribute to an ongoing novel study where they actively listen to the material being presented. Each member is engaged through chapter questions geared to their comprehension level. After the reading portion of the program is complete, members take part in a fun activity based on the chapter. 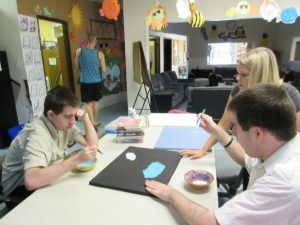 The Art Program allows the members to use different creative materials to create art projects, which encourages sensory and motor skills, along with improving and maintaining hand eye coordination. Often, art pieces are a collaborative effort, which encourages team work and social skills. Learning how to correctly use the art tools (paint brushes, paint, scissors, glue etc.) develop fine motor skills, and an understanding of how much of each resource to use. A large portion of our art program is creating, painting and decorating the Sunrise building for recreation events like the dance. This Program helps to improve and maintain emotional well being and physical health. It can help improve mood by reducing stress and anxiety, and develops the member’s self-esteem and confidence. Our members participate in a variety of activities including karaoke, dancing and sing-along. In the past we have written and created our own plays which were recorded. The members greatly enjoy watching these and many of them still talk about the characters that they played! In Fitness our members experience various forms of fitness activities. One of our most popular is yoga. Another popular program is Tai Chi where they follow along with a video and learn about the importance of exercise and self-reflection. In the warm months we often go for walks in our community or go exercise by the lake. This program is excellent for increasing gross motor skills, teaching health and nutrition as well as providing physical exercise for our members. In our Humanities Program, members are given the opportunity to learn about various topics that they may find of interest. In the past our program facilitators have taught them about the butterfly life cycle, the seven natural wonders of the world, Martin Luther King Jr. and more. The topics are often suggested by members and the group enjoys learning in various ways whether it is through PowerPoint, videos, question and answers, crafts, games and more! This program increases the member’s knowledge of things in their world, fine motor skills, gross motor skills and social skills. This program rotates between a Fundraising Program where members create products for sale in the Sunrise Shop and our Life Skills Program which focuses on creating and maintaining important life skills for our members. Some topics covered in life skills are money management, fire safety, learning to write letters, personal hygiene and public transit. Our fundraising program helps members increase their fine motor skills, their creativity and their independence. The Baking Program allows the members to become familiar with baking utensils and equipment, their names and how to use them. The members learn about the ingredients used for baking and their nutritional value. It is a social activity that gives the members pride in their achievement of the finished product. Member’s look over the recipe, gather the ingredients and in teams create the recipe with staff guidance. At the end of the day, members get to take their treats home! The Fun Friday Program is a day where the members get to enjoy themselves with more recreational style activities. 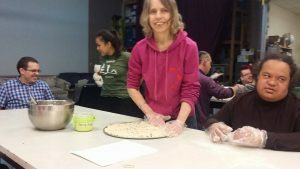 As with all of our programs, there is a life skills element, in the preparation of food, social interaction in the group activities, and lots of laughter. Some examples of a Fun Friday would be going to the local movie theatre, visiting Nova’s Ark, themed days, bowling and sometimes we can afford larger trips. An example of a theme day would be Science Day where we learned about different types of experiments, how to form hypothesis and conducted our own experiments.